While I am working on my own business, I am thinking about make money online. Perhaps, we have been listening to many people say about making money online, and I always wonder how would this be? After sitting in several briefing or webinar, I get a rough idea about methods for making money online. There are various ways for those marketing getting pay, and Google Adsense is just one among all. 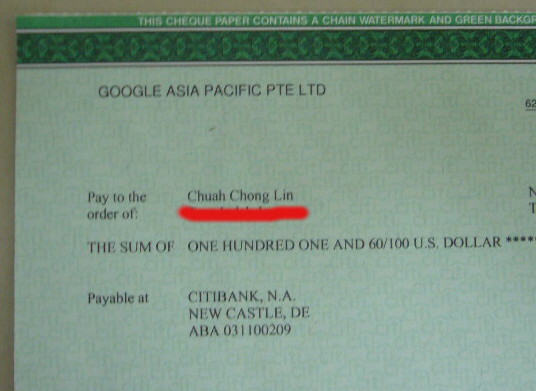 Today, I have the pay cheque from Google, and seems l really get paid. Even though this process is a little long, it takes me 4 years in order reaching USD100, the first threshold, for Google to pay me. Anyway I still want to write something to record down this incident and make it a step stone for moving toward next regime. Google Adsense is one of the ways for making money online. I had registered Google Adsense account, and always wonder if this is real for Google to pay me while my reader is viewing Google Ads via my blog. Assertive Way. Compare to other methods, such as Clickbank, CPA. I think Adsense is an assertive way that we do not require additional skill or affecting other while surfing in net. Personal Record. Anything is coming out from my own words or video to record my personal improvement is not a bad idea too! At least we have something record for future referral. I am managing more than 20 websites after so many years of working on the web, most of the website are classified as Business Website whereby the website is supporting a genuine business. I would say most of my business websites are ranking quite well. In order to keep the website a professional looks, I did not incorporate Google Adsense in these business website. On the other hand, I do have several websites which I think is less business related or more on social sharing, this is where I insert my Adsense advertisement in my article or blog. 1) My personal blog, www.clchuah.com. This is a blog format type of website which I am sharing anything with friend via I live my living. 2) A business blog, www.maxwaytec.com. This is the business website with less business attention while I started. Now this website has gained more weight in real business activity. 3) Personal Blog, www.tankuanyew.com. This is another personal blog which the content is mainly written in Chinese Character. After I am published a blog or article, what I do is sending invitation to my follower in FB and let them got the opportunity to read. This is how I get more ads viewing click rate. This first USD100 threshold takes me 4 years to achieve, and definitely I want to improve from here. This is what I want to do in order to get better click. 1) Hot Topic Content rather than just good content. Share article with friends and follower, the content need to be good or at least readability. However a Hot Topic Content is important to gain my reader attention and virally spread out to other. 2) Consistent Follower. Managing a website target to certain topic or hobby is to ensure we could have consistent reader and follower. 3) Viral Spread the Article. There are many social platforms in the world which you want your content is well linked. Make sure your content is linking to FB, WeChat, Twitter and so forth to get maximize spread. 4) Ever Green Content. I am not a professional writer who writes for living. I would write some ever green article which will stay there for awhile. July 2014 is a remarkable month for getting paid by Google under Google Adsense program. Let see if I could reach another mile-stone faster or quicker to show my effort for making money online. In previous section, I got paid by Google by participating their Adsense program. Actually Google issue me a cheque from US, I am telling you how I cash out the money. I directly bank in this cheque to local bank, in this case Maybank. The bank will help me to proceed the cheque clearance with respective bank. However there are several charges incur through out this process. Agent charges: USD20 per cheque clearance. After deducting all those charges, I am getting net RM230.01 for this Google payment. This entry was posted in Social Topic, Technology. Tags: google adsense, make money online. Could u elaborate how u could get better ranking? I am putting up an article and live working progress for coming 3 months time for get a website rank on several keywords. You could just find out more about this project via below link.